This is a reworking of my original Back Off routine, which appeared in my 1979 lecture notes and later in Darwin Ortiz at the Card Table. At first glance, it might appear that little has changed. The original structure and most of the handling remain the same. This new version, however, is more practical both because it is self-contained and because it's completely in-the-hands, no longer requiring any kind of working surface. This makes it ideal for table-hopping situations where the tables are typically littered with dinnerware. Most importantly, in terms of audience impact, this version offers three big improvements over my original: 1) greater conviction; 2) audience participation; 3) a far stronger climax. The fact that the initial show of the cards is more convincing, that the spectators get to handle each card before it's changed, and that the last card changes while held by a spectator combine to produce an audience impact several times stronger than I used to get with the original handling. In the January 1994 issue of MAGIC, Richard Kaufman described Larry Jennings' ungaffed version of my original Back Off routine (Bacfe Off Sans Gaff, pp.52-5). In it, he wrote, "The price you pay [lor eliminating the double-backed card] is the use of a six-card packet as four, instead of five as four," I would say, rather, that the price you pay is not having a double-backer. In other words, the double-backed card is not a drawback of this routine. It's the routine's greatest strength. You don't have to be a card man, or a genius, to see through rhe ruse of holding two cards face to face as one. If you think that this ploy, combined perhaps with a Flushtration count, is going to convince people that you have a handful of misprinted cards, I think you're being naive. They may buy the notion provisionally. But, as soon as you start printing faces, they're going to realize that the cards had faces all along. In The New Back Off, the diminishing lift sequence is so convincing in large part because you show the same real double-backed card repeatedly. 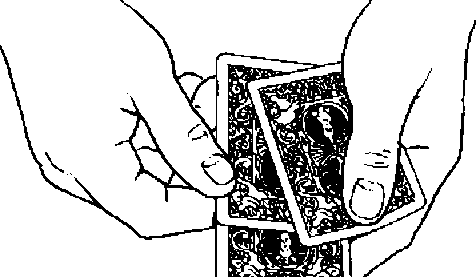 The presence of this one double-backer also allows you to put each card in the audience's hands just before transforming it. This is particularly important since, no matter how convincing the initial display, once you start printing faces, people will question their initial belief. It's the act of handing out each subsequent double-backer (actually the same double-backer) that keeps conviction high to the end. You get a tremendous amount of mileage out of that one gaff. Eliminating it would produce an effect that's more convenient to periorm but one that's hardly worth performing. & An issue closely related to the above is the decision to hand the cards out for examination. Whether props should be handed out is something magicians debate constantly. They usually approach the question from the wrong end. The starting point should not be the prop but rather the audience. What does it take for the audience to experience magic in a particular effect? What must they believe? Sometimes one of the things they must believe is that a certain prop is ungimmicked. Thfi Coin in Bottk is a good example. This effect would be a waste of time if the audience wasn't convinced that both the coin and the bottle were ordinary. The next question is whether the audience will believe it without proof. In some cases, the very nature of the effect brings suspicion on the props. Again Thi Coin in Bottk is an example; so are most Printing and Wild Card type effects. If the audience needs to believe that something is ungimmicked in order for the trick to be a miracle, and the nature of the effect will make them doubt that it is, you had better find a way to convince them. Sometimes, the best way is to borrow the item. Other times, the best way is to hand out the item for examination. The first time you periorm this and see how carefully people check out the double-backed card during the effect and the regular cards after the effect, you'll realize the importance of handing out the cards during the performance and giving them away afterwards.